DAILY LENTILLAS EXTREME TORIC 1 DAY HIGH PERFORMANCE AND COMFORT EVERYDAY! Maintenance: Not necessary, disposed of with a use. Format: boxes of 30 units. 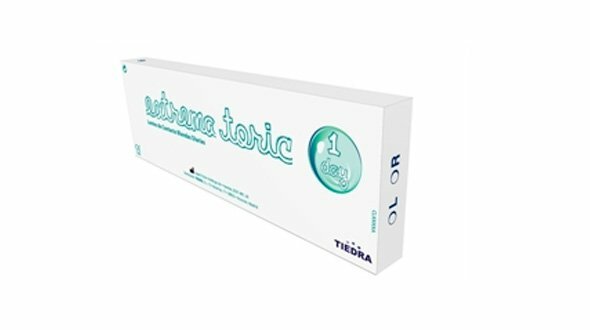 Extreme 1 Day Toric is a daily lens, created for the correction of myopia and astigmatism. It is specially designed to provide great comfort and stability in its use, as well as great ease of adaptation. These daily lenses have a special design, which incorporates the so-called "Optimized Ballast Design". Unlike the rest of daily toric lenses, Extreme 1 Day Toric has a ballast rounding the entire optical zone with a constant horizontal thickness, which allows maximizing the stability of the lens in the eye, reducing the twist with the flicker, which We improve the patient's vision. The result is a stable vision, in addition, thanks to its smooth and smooth surface, we increase the comfort of the lens during its use. A high performance daily lens. When ordering contact lenses in our Online Optician note that it is absolutely necessary that an optician or ophthalmologist sight you graduate and you prescribe lenses . The last graduation must have taken place in the last 6 months, unless the Optician or the Ophthalmologist indicates otherwise. We recommend that you check your eyes frequently. It is absolutely necessary to take into account recommendations for the use of contact lenses. Follow the advice of the manufacturer Tiedra Eurolent / Optician / Ophthalmologist and never wear the lenses for longer than established.Extrema 1 Day Toric lenses require basic care and it is important to follow the recommendations. If you notice that your eyes are irritating or you do not see correctly, remove them immediately and consult your optician or ophthalmologist. Do not wear contact lenses in poor condition, discard them and use new ones.